Thank you to all of our volunteers for their time and commitment to ACUIA! Please contact the Executive Office at acuia@acuia.org if you are interested in volunteering for any of the opportunities. Responsibilities: Provide leadership role within ACUIA by maintaining the strategic focus of the organization. The Board meets monthly via conference call and in person at least once per year. Board members are elected by the ACUIA Membership. Board of Directors: Visit the Leadership page to view current Board of Directors. Responsibilities: This role was established to create a pool of individuals who may wish to serve on the Board of Directors at a later date. The Associate Members participate, but have no voting rights, in monthly Board of Director conference calls and in person at least once per year. Associate Board Members are appointed by the Board of Directors. Associate Board Members: Visit the Leadership page to view current Associate Board Members. Responsibilities: Organize the annual region meeting(s). Encourage cooperative relationships among members to facilitate the exchange of information and ideas. 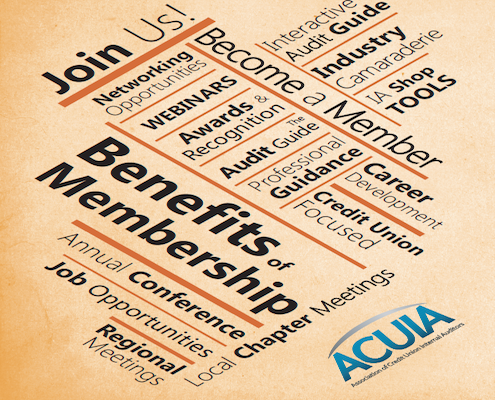 Promote ACUIA and the credit union internal audit profession. Communicate ACUIA events, information and board decisions to your Region. Recruit Chapter Coordinators within your Region and ensure appropriate information is communicated to them. Assist the Board of Directors in carrying out their responsibilities. Prepare a summary of regional and chapter activities for inclusion in the ACUIA Audit Report magazine. Regional Directors must be available to attend quarterly conference calls with Board Liaison and Chapter Coordinators. Regional Directors: Visit the Regions page to view current Regional Directors and openings available. Responsibilities: Establish a chapter which consists of ACUIA members in a major metropolitan area or state and continuously identify new members for the chapter. Coordinate meeting locations and times, develop meeting agendas, and obtain speakers when appropriate. Meetings may include, but not be limited to, training sessions with speakers, round table discussions, luncheons, and informal sharing of best practices. Inform your Regional Director of chapter activities and prepare a summary of chapter activities for inclusion in the ACUIA Audit Report magazine. Chapter Coordinators must be available to attend quarterly conference calls with Board Liaison and Regional Directors. We encourage you to start an ACUIA chapter in your area. Chapter Coordinators: Visit the Regions page to view current Chapter Coordinators. Responsibilities: Work with the Board Treasurer to ensure an annual audit of financial statements occurs and ensure the Board and ACUIA Executive Director address any issues. Generally meets two to three times a year through conference calls to discuss audit progress and results. Responsibilities: Work with the ACUIA Executive Office to organize the Annual Conference including but not limited to selecting topics speakers, arranging the session schedule, planning social events, etc. The committee members rotate annually and will need to participate in monthly conference calls from approximately October – June. Responsibilities: Evaluate and select the winner of the Terry McEachern Internal Auditor of the Year contest. Awards are announced during the Annual Business Meeting at the Annual Conference. The committee members rotate annually and judging is completed during the month of May. Responsibilities: Evaluate and select the winners of the Best Practice contest. Awards are announced during the Annual Business Meeting at the Annual Conference. The committee members may rotate annually and judging is completed during the month of May. Responsibilities: Evaluate candidates for the Board of Directors election, utilize vendor to send and tabulate electronic voting, verify ballot totals, announce election results during the Annual Business Meeting at the Annual Conference. Responsibilities: Maintain ACUIA’s social media presence through Facebook, LinkedIn and Twitter by posting announcements, pictures, articles, discussions, etc. Work with the executive office to update website as needed. Responsibilities: Collaborate with Chairperson to organize annual webinar schedule, plan and select webinar hot topics relevant to the greater membership, and retain qualified speakers. Committee will be responsible to coordinate all aspects of the webinar with ACUIA Executive Offices. Generally meets two to three times per year through conference calls to discuss progress.